SC Picture Project | Charleston County | T.W. Graham & Co. This humble building tucked within the Francis Marion National Forest is T.W. 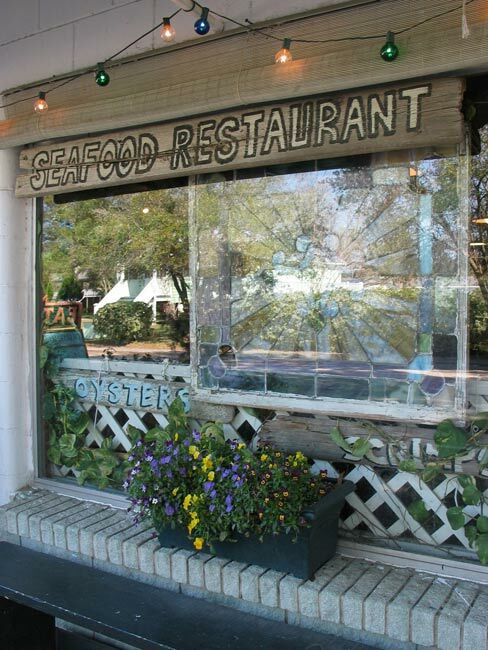 Graham & Co., a seafood restaurant located in beautiful McClellanville. Husband-and-wife team Pete and Claudia Kornack opened the popular spot in 2003 to rave reviews from seafood lovers and sweet tooths (sweet teeth?) who fill the dining room for fresh seafood often caught by Pete himself and and desserts crafted to an art by Claudia. Expect a wait should you choose to dine here; a cozy dining room lends to the casual yet intimate atmosphere that also draws people to this tiny seafood haven. Though it is small, the experience is worth it when diners are served a bowl of T.W. Graham’s famous chowder. In fact, the food here has attracted such a following that Andrew Zimmern of the Travel Channel came calling in 2011. Zimmern, who also visited local favorite Martha Lou’s Kitchen during his Charleston visit, was duly impressed with the fare at T.W. Graham. But don’t take it from us – or the Travel Channel. The next time you find yourself lucky enough to be in the heart of McClellanville, stop by and see – er, taste – for yourself. Reflections on T.W. Graham & Co. The black and white photo above was taken by Amanda Sprowles in November 2006. Amanda describes herself as merely a photography enthusiast, not a skilled photographer. She brought her family to McClellanville to use the picturesque downtown as a backdrop for a series of family pictures. We have to disagree with Amanda’s assessment of her photography skills. We love this picture and are thankful to her for sharing it with us!